Abstract: AGP 3.0 specs a.k.a 8X AGP doubles the available bandwidth between the videocard and the system from 1.06 GB/s to 2.1 GB/s. MSI have been a favorite of ours here at PCStats for the longest time because they always put out well rounded products which may not necessarily be the fastest, but typically always offer good value. MSI's Ti4200 PCB layout deviates from the reference design slightly which is interesting to note. The MSI Ti4200-TD8X64 is backed up with just 64MB of 4ns Samsung TSOP-II DRAM, and as you can see from the pictures, there are copper heatspeaders on both the front and rear DRAM's. 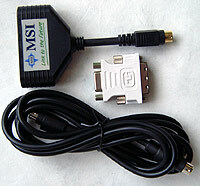 MSI include an attachable VIVO (unit has both S-Video and composite out) module with the Ti4200-TD8X64 even though the Phillips 7104E only supports TV Output. The card includes a DVI to analog converter which means you can use that DVI socket for another CRT display if you are lucky enough to have two monitors. To be frank, while the card is very nice, what really impressed us was the total solution MSI offer up, and in particular the huge software bundle. The Ti4200-TD8X64 comes with FarStone's Virtual Drive and Restore It software, InterVideo WinDVD 5.1, InterVideo WinProducer/WinCoder, a seven demo CD and full versions of Morrowind, Duke Nukem Manhattan Project and Ghost Recon. 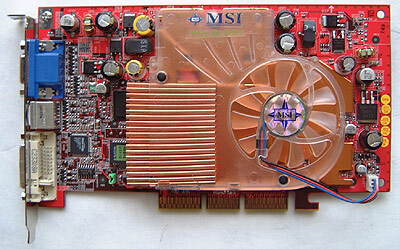 Software bundles usually just add to the price of the videocard, but the MSI Ti4200-TD8X64 was still the least expensive card of the bunch at about $170 US! The copper GPU heatsink looks similar to Abit's OTES in that it uses copper fins soldered to a copper base plate, but there is no heat pipe, or noisy squirrel cage fan to deal with. Instead, the cooler is simply based around a large copper heatsink with a conventional fan that somewhat resembles the layout of the reference heatsink. There is a large copper heatspreader on the back of the card in contact with the memory as well. Does this cooling solution make for a better overclocking? With the MSI Ti4200-TD8X64 clocked at 250 MHz by default we began to raise the core speed slowly... and at 300 MHz we hit the wall. Any further increases in speed and the videocard would lock up while running the CodeCreatures benchmark. With 4ns memory, we didn't have the highest hopes when it came to memory overclocking. We were pleasantly surprised when we found the Ti4200-TD8X64 memory able to reach 610 MHz without artifacting.